What a titillating sound bite it is: Japan’s first gaijin (foreigner) geisha! Who wouldn’t want to hear the experiences of a white girl who lived a life that we Westerners have only known through the clouded lens of romantic Orientalism, or “Memoirs of a Geisha” or various other media images? It was partly her desire to give such a firsthand account that prompted social anthropologist and filmmaker Fiona Graham to join a geisha house early last year and then to live, at least for a while, that life of legend. 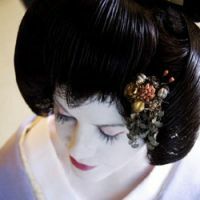 “I have investigated a number of Japanese topics, and doing geisha seemed a great idea, as not much has been written on geisha from an insider’s point of view,” said the Australian. The somewhat calculated nature of Graham’s geisha gig sets her apart from many foreign practitioners of Japanese arts, whose attachment to their pursuit generally stems from a “fated” encounter that brought them to Japan and changed their lives. And yet it is the emergence of foreigners like Graham — who have such a deep understanding of Japanese culture that they really can wake up one day and decide to become a geisha — that is perhaps most indicative of increasing foreigner infiltration into this country’s cultural domain. “I have spent half my life in Japan,” said Graham, who — in line with traditional geisha coyness — refused to give her age, but did say she first came to Japan as an exchange student at age 15. Sayuki (Graham’s geisha name) joined a “geisha house” in the Tokyo district of Asakusa early last year and, after almost a year of learning “basic manners — opening and closing doors, standing, sitting and everything in between” — debuted in a flurry of colorful kimono, white makeup and pomposity in Asakusa. It was Sayuki’s membership of the geisha house and her formal debuting as a geisha that set her apart from other non-Japanese “geisha” in the past — most notably American anthropologist Liza Dalby, who in the 1970s spent a year in residence with geisha in Kyoto, training with them and accompanying them as they worked. Sayuki explained that she skipped the apprentice stage in the conventional geisha career path (known as maiko in Kyoto or hangyoku in Tokyo) because of her age (apprentices are usually younger than 22).But Sayuki’s “debut” did not mean that her training was over. Far from it: “The older geisha attend lessons and practice on a daily basis into their 90s,” she said. The training involves classes in tea ceremony, dance, and musical instruments such as bamboo flute and drum. Geisha “work” involves attending special events, such as public tea-ceremony performances during the day, and going to banquets at night. The banquets are generally held at exclusive ryotei Japanese restaurants, but geisha will also go to private residences. It costs upwards of ¥80,000 to have two geisha attend a banquet for two people (the cost depends on the number of guests, as well as the number of geisha). 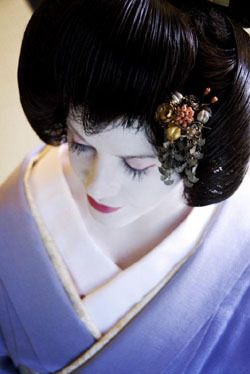 For that fee, the geisha will play musical instruments, dance and chat with the guests. As to the question of whether the geisha-client relationship ever continues after the banquet, Sayuki displayed her talent for evasive geisha-style wit, saying she is only ever asked such lewd questions by foreigners. “Any woman . . . can fall in love, but it is never part of the job,” she said. Sayuki said one of the most enjoyable things about being a geisha is wearing a kimono, which she must choose carefully to match the season. That said, kimono are famously expensive — with a single outfit often topping ¥1 million (around $10,000). Sayuki explained that she was “very lucky to have been given a basic collection . . . by some of my wealthier friends” . . . and that she also uses kimono owned by her geisha house. Having wealthy Japanese friends is one way Graham’s long experience of living in Japan has facilitated her transformation into the Sayuki persona. Also vital has been her fluency in Japanese and, more surprisingly, her experience of working for two years at a large Japanese company. Graham says she hasn’t decided how long she will continue to be a geisha. For the moment, she is working on a plan to make it easier for non-Japanese to get a glimpse of the closed world she currently inhabits. Sayuki and her geisha girlfriends are holding special tea parties for non-Japanese at a fraction of the normal prices. See her Web site at www.sayuki.net for details.